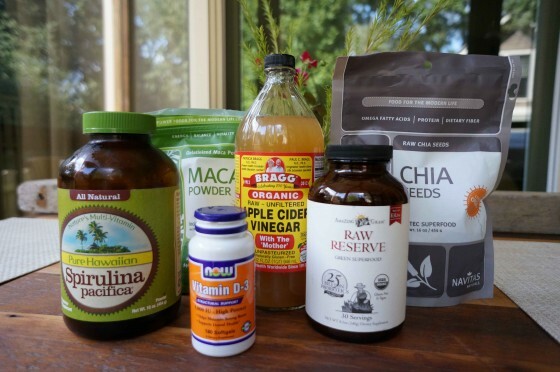 Cleanses and Detoxes and Superfoods….and YOU?? Where do you fit in with all these trends? Is it all hype to you? Or are you on Day 3 of your please-don’t-mention-food-to-me juice cleanse? Does your diet have enough color, variety, antioxidants, nutrition, ahem, produce to keep you healthy? It is so hard to know in this age of powders and mega-nutrients packaged affordably and at eye-level, making us question whether we really are getting enough sea vegetables in our daily intake of normal-people food. I myself have bought into it, to a degree. I mean, I have my shelves of nutritional supplements, including Spirulina, chia seeds and “Power Fuel.” I do feel good about these few add-ins, but in truth, I wonder if I even need to take my daily multivitamin anymore, now that I’m hyperconscious of every bite I take, and now that plants have become the largest slice on the pie chart that is my diet. If I consciously eat bell peppers simply because I haven’t had enough color in my diet yet today, I think it’s likely I’m at a point where my diet doesn’t need supplementing. But what if it does? The constant barrage of news and findings in the media keeps us wondering, and there’s just something about second-guessing when it comes to your health. You don’t want to do it. So, what’s my advice? As usual, everything in moderation. That means, if your heart is telling you it’s time for a juice cleanse, then try it. But don’t do 30 days; do 10 days. Take a look at the supplements out there, then take a look at your diet. Know that the supplements are not going to do the work of a good diet. They are not going to keep you healthy if you swallow them and then sit down to a greasy hamburger. My advice is to always eat consciously, aware of the nutrients you are consuming. Only then can you decide if your diet is lacking in something. If you scan the aisles at Whole Foods the sheer number of supplements available can be overwhelming…even enticing. But necessary? I’m not so sure. This entry was posted in cooking, diet, healthy eating, mental health, nutrition, personal history, recipe, vegetarianism, weight loss on September 16, 2013 by Karen.